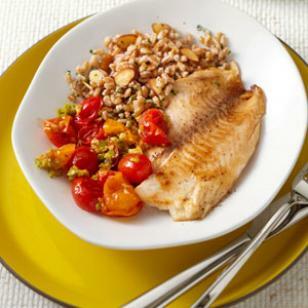 Top tilapia fillets with a savory tomato-olive sauce that comes together in just 5 minutes. Look for tapenade near jarred olives in the supermarket. Serve with sautéed broccolini and farro tossed with toasted almonds. Sprinkle tilapia with salt and pepper. Heat 1 tablespoon oil in a large nonstick skillet over medium-high heat. Add the fish and cook (in two batches if necessary), turning once halfway through, until golden brown and just opaque in the center, 4 to 6 minutes total. Transfer the fish to a serving platter; tent with foil to keep warm. Off the heat, add the remaining 1 tablespoon oil, tomatoes, wine and garlic to the pan. Return to medium heat, cover and cook, stirring occasionally, until most of tomatoes are broken down, 4 to 5 minutes. Stir in olive tapenade and cook for 1 minute more. Serve the fish with the sauce.